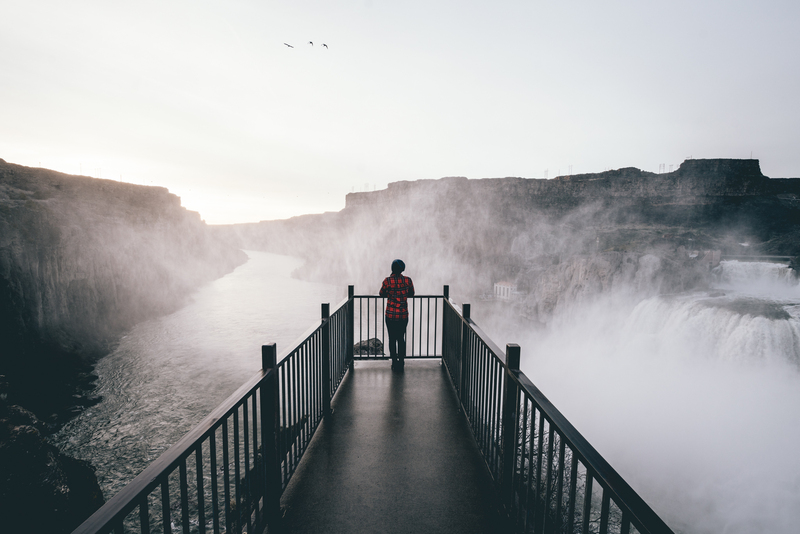 When I first visited Idaho to produce a month long winter road trip guide, never did I imagine that I would love the quiet and overwhelming nature-filled state so much that just 3 months later, I found 11 reasons that made my move the best decision of my life. 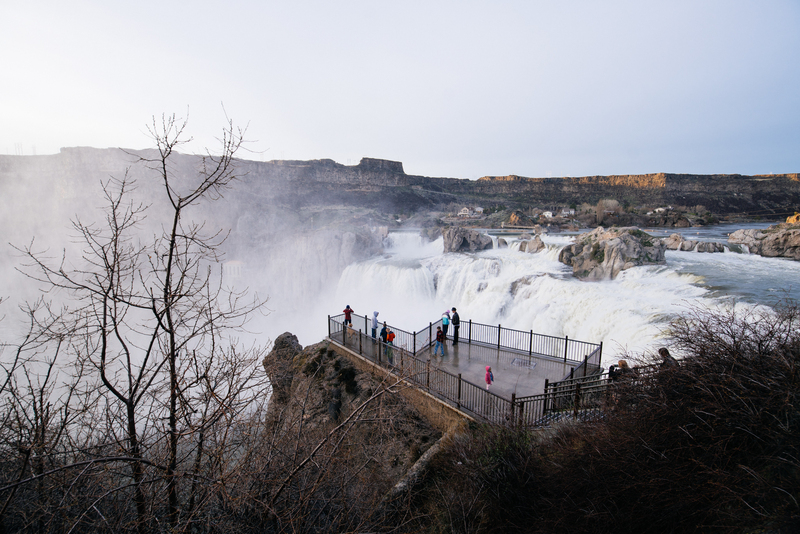 Now, as I work on a follow-up piece highlighting all of the reasons I am still glad I made the move, it’s hard to believe that Shoshone Falls, just a two-hour drive from my home in Boise, has evaded me until yesterday. 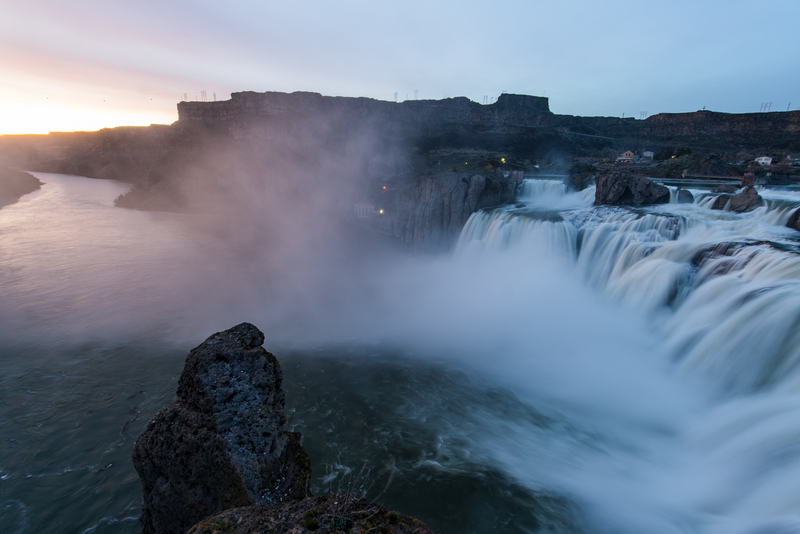 Right now, Shoshone Falls is flowing at unbelievable 18,000 cubic feet per second, as shown in this video. Knowing this monstrous water flow won’t last long, I knew that there was no better time than right now for my first visit. 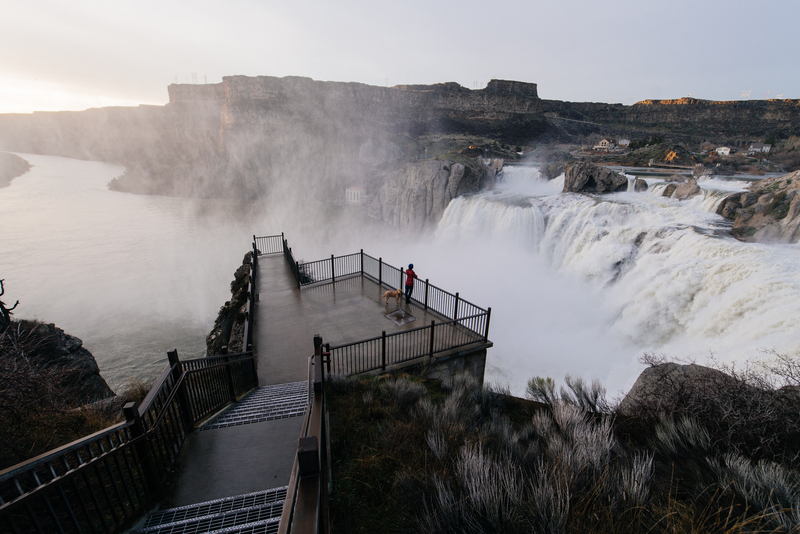 Sitting just minutes outside of the city of Twin Falls, the 900 foot wide wall of water is at it’s strongest since 1997. So, obviously, I had to see the “Niagara of the West” for myself. And how did the waterfall get its nickname? Well, for one, its 212-foot drop actually makes it 45 feet taller than the famed waterfall outside of Buffalo, New York. Still recovering from the awesome time of this year’s Treefort Music Fest, I needed some nature to wash down the remaining taste of the weekend’s endless supply of Barbarian Beer and Bacon & Sage Popcorn from Bittercreek Alehouse. So I grabbed my favorite red flannel model, Caroline from Nine8Six Idaho Apparel and her just trimmed puppy Lilly, and we hit highway 84 on a mission to make the falls before sunset. The entire drive, a thin, light gray cloud layer sat across the western part of the sky. While it created a nice diffused light, I spent the two-hour drive worried that I wouldn’t get nice light on the falls, but at least I could add some nice video clips to my Instagram story. I also figured the sky would be a bust, which as any photographer knows, is a great possibility when you don’t see the fluffy white cumulus clouds overhead. We made the short winding road that leads down to the overlook about 7:30pm, a good 30 minutes before sunset. 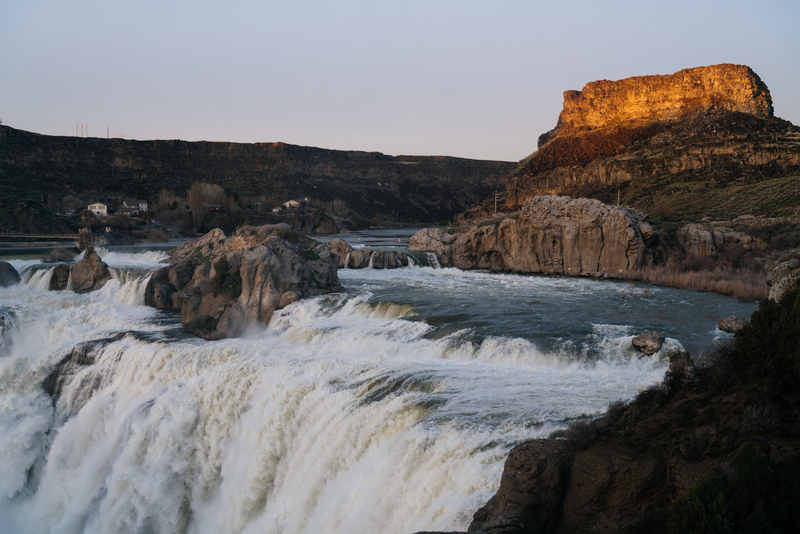 But being that the Shoshone Falls sits in the Snake River Canyon, I didn’t take into account the fact that the sun would stop hitting the wall of water straight on well before the actual sunset time. But, as the diffused light cascading across the roaring waterfall, I was able to start getting some nice, evenly lit photos. The entire time we were there (Tuesday night at 7:30pm), there was never too many people on the platform, which is a far cry from the jam-packed weekend crowds right now. If you can, visit on a weekday, and later in the afternoon. 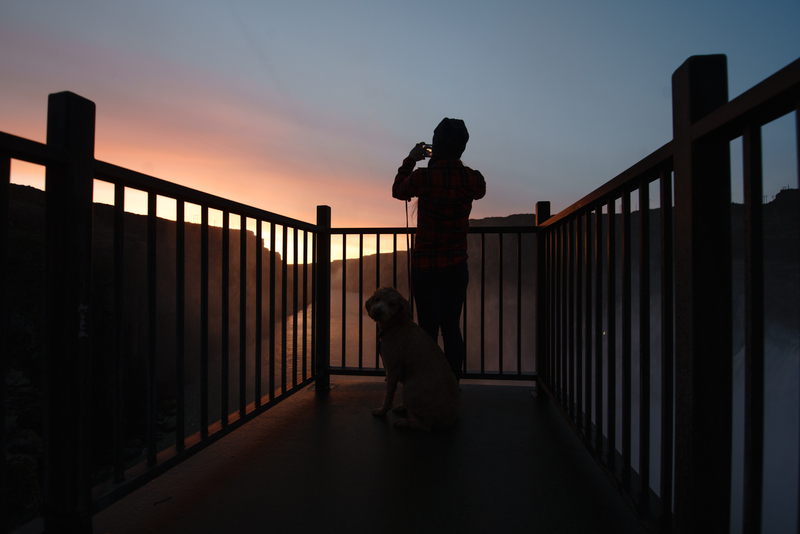 I looked to the left, where a narrow walkway leads out to a west facing overlook that stares down the dramatic canyon and the sky was lighting up in a strong orange. This would normally would be a beautiful site in itself, but because of the massive haze created by the fast moving mist, the colors danced in front of us. Even after taking thousands of photos during Treefort, the scene easily forced me to overcome my photography exhaustion, and I quickly started snapping photo after photo, knowing that the light wouldn’t last long. But, it did. Much longer than I expected. 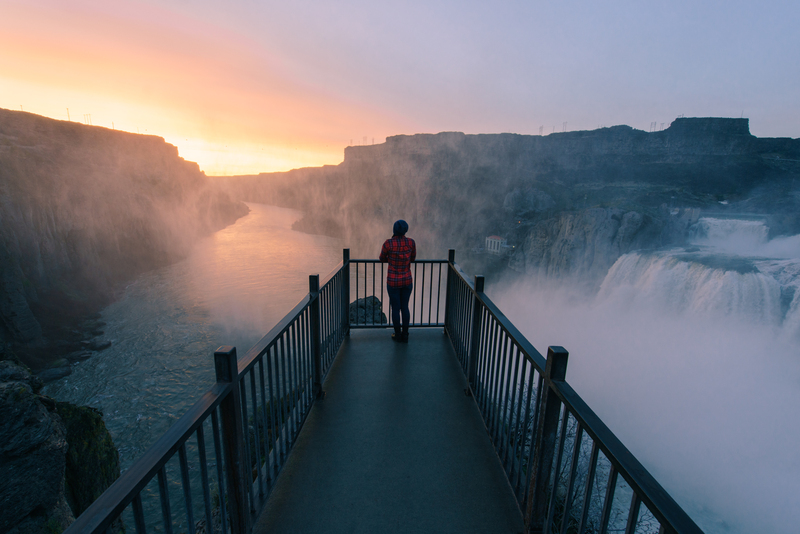 The oranges slowly turned to a reddish/purple that illuminated the canyon to the left, but a cool blue hung over Shoshone Falls to my right, immediately making me think “I should name this photo ‘Fire & Ice'” before laughing that notion out of my head. 46 minutes after I arrived, I took my last photo as the color faded and Blue Hour started to descend. I knew I took a good amount of photos, but even I was shocked. 475 photos in 46 minutes. And as a photographer and avid nature lover, those 475 photos remind me how much I love Idaho. 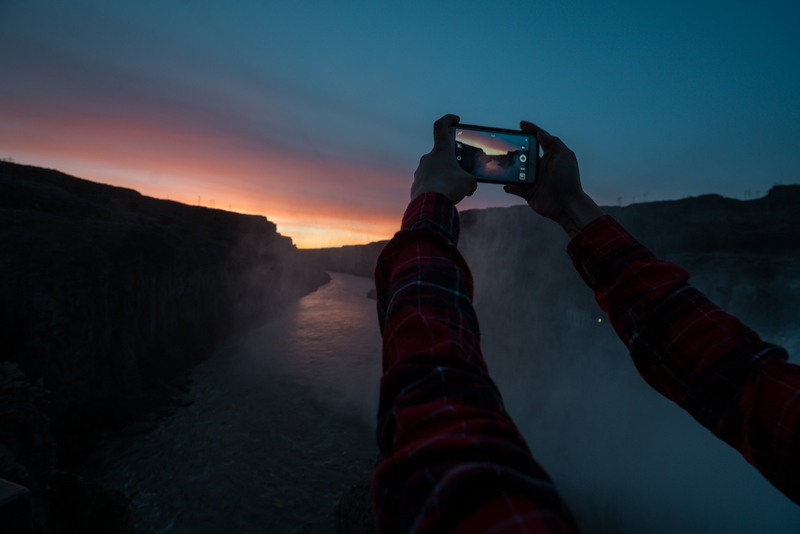 If you head out to Shoshone Falls, here are a couple of tips to get better photos. Bring a rocket blower, as the mist is wet and water will completely cover your lens. Lens clothes only smear the water, so bring an air blower to blow the water off to the edges of the lens. If you don’t have a weather sealed camera, beware. 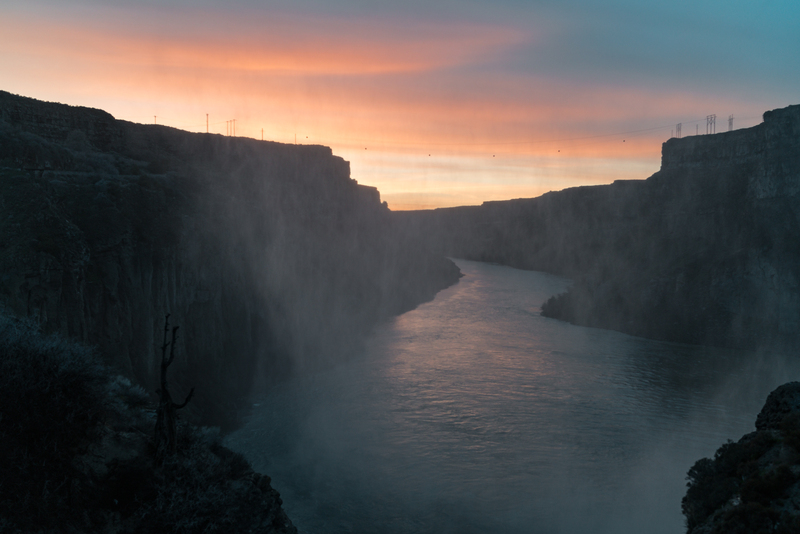 Sunset is a great time to visit, as the light in the Snake River Canyon was incredible, and there were not many people there…and those that were there did not stay long due to the wetness. 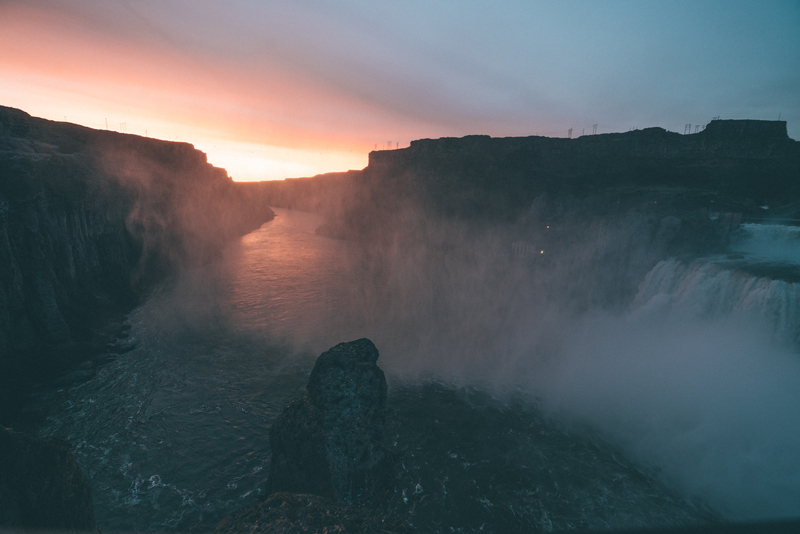 If you have a Neutral Density Filter, you can create smooth water (like in the final photo below) by tricking the camera into capturing a longer exposure. My personal favorite is around 1 sec, which gives the water smooth, yet dramatic movement. Bring a friend who can stand in as your model to help add scale and a sense of adventure to the photos. Make sure they wear bright colors that will stand out! Be patient and wait for the crowd to leave and to get shots of your friend all alone in front of this imposing wall of water. You might not get light like I did on my first try. That’s ok, if you have time, plan to return. If you cannot, just be in awe of the scene you just witnessed, with or without great light. Remember to stay in the designated viewing area! A different angle is not worth your life. A couple of days ago, a man fell 50 feet here and remains in critical condition. BE SAFE! I only have seen it at the ‘wrong’ time of year, when it was rock and trickle. Thanks for correcting my first impression!